Right after school ended on Thursday we hopped on a little boat and headed to the neighboring islands of Ofu (O-foo) and Olesega (O-luh-sang-uh) for the long weekend. It was only about a 45 minute ride and the water was really calm on the way over so it was pretty nice. The JROTC instructor at Manu’a High owns a little bed and breakfast-type motel on the island of Olesega called the Asaga (ah-sah-ngah) Inn. We spent Thursday night there and then went over to Ofu to stay with our fellow volunteers, Erin and Jessica, on Friday night. Home sweet home. This is the island of Ta’u. We live on the left. The islands are connected by a little one-lane bridge that is somewhat famous for being a great place to jump. I did not jump off of it, because I am not insane, but the rest of the group did and had a great time. It looked like a lot of fun but I am a lot of chicken so I just took pictures/video for the other Manu’a folk. On Friday, on the way to Erin & Jessica’s, we got dropped off at the National Park. There’s a little run-down fale called the Hurricane House across from the beach. The beach, by the way, has consistently ranked at one of the top 10 beaches anywhere, and recently made the top 5 undiscovered beaches in the world list. So yea, it was pretty sweet. Snorkeling was incredible. The coral there is so healthy and vibrant. It was quite a change from what we’re used to in Ta’u. We met another palagi at the beach and ended up going to The Lodge to hang out with him. The Lodge is part of the hotel on Ofu and it was super nice. There’s a pool table, a little library area, wireless internet…it was just a great place to chill. All this time I thought Erin and Jessica had nothing to do over there, since they live on an even smaller, even more remote island than we do, and it turns out that they have a community center, two hotels, and one store that’s as big as a (small) gas station store at home. They had more of a selection as far as food goes, and some stuff was cheaper than it is on our island! Since boats can’t run on Sundays, we had to leave Saturday morning to come back. It had rained Saturday night and started again while we were on our way back, so the water was pretty choppy. Courtney ended up getting sick and we all immediately started cracking up and taking pictures, but as we got closer to the wharf the more I felt like I was going to have to join her at the railing. Erin and Courtney on the way back. The water was pretty rough on the way back. It was a really great trip and it was sooooo nice to see Erin S and Jessica. Their house is great, they fed us some delicious and creative foods (we actually had pizza! ), and they had a lot of helpful things to share about their experiences teaching elementary. It was a good time and I can’t wait to see them again. 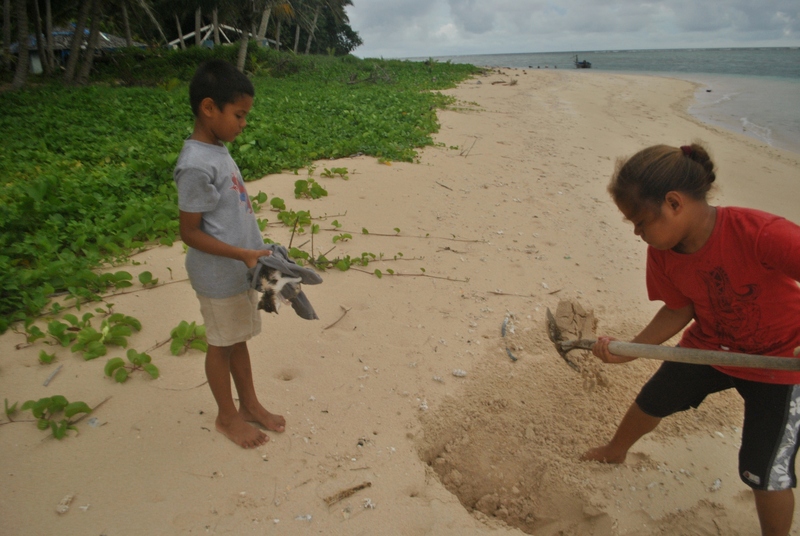 Some kids burying a cat on the beach in Ofu. In other news, I’m just trying to keep my head up and not be frustrated by the apathy, lack of order and consistency, and the general “whatever” attitude that permeates island life. For the first four months I thought all of these things were right up my hey-man-relax-what’s-the-hurry? alley but lately it’s been kind of hard to deal with. (It’s all part of that silly cultural-adjustment curve that WorldTeach spent so much time explaining to us while we were in the first stage and not paying attention.) So if you could pray about that I’d be much obliged. I don’t know what’s happening here but I love it soooo much. This entry was posted in American Samoa and tagged Asaga Inn, beach, coral reef, national park, Ofu Olosega, photos, snorkeling, travel, vacation. Bookmark the permalink. Yeah, I’ll pray for that. Miss you guys. Glad you’re having such a rad time. Thanks again for more Great pics and updates! What did you finally do for an underwater camera? (the pics are fantastic). Did you ever get any boiled peanuts? I’m a dam’ Yankee and don’t know if you shell them, boil raw / “naked”, salt ’em, etc. – (they taste like cold butter beans or chrowder peas to me). Looks like I need to send Wes some scissors and razors! – actually, I’m envious. I had to laugh about the small boy(?) pic, being held by two older girls / sisters; one with two sharp, stick-swords, and one gripping shirt, arm pit and whispering death threats! OMG its so good to see my nieces and nephew in here……Love this.